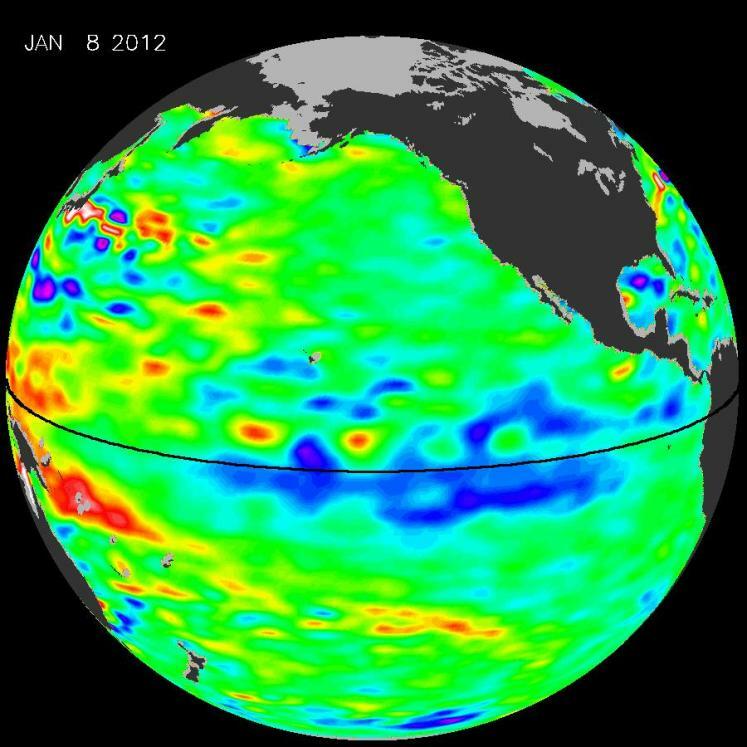 01.18.12-Jet Propulsion Laboratory NASA-La Niña, "the diva of drought," is peaking, increasing the odds that the Pacific Northwest will have more stormy weather this winter and spring, while the southwestern and southern United States will be dry. Sea surface height data from NASA's Jason-1 and -2 satellites show that the milder repeat of last year's strong La Niña has recently intensified. "Conditions are ripe for a stormy, wet winter in the Pacific Northwest and a dry, relatively rainless winter in Southern California, the Southwest and the southern tier of the United States," says climatologist Bill Patzert of JPL. "After more than a decade of mostly dry years on the Colorado River watershed and in the American Southwest, and only two normal rain years in the past six years in Southern California, low water supplies are lurking. This La Niña could deepen the drought in the already parched Southwest and could also worsen conditions that have fueled recent deadly wildfires." The comings and goings of El Niño and La Niña are part of a long-term, evolving state of global climate, for which measurements of sea surface height are a key indicator. Jason-1 is a joint effort between NASA and the French Space Agency, Centre National d'Études Spatiales (CNES). Jason-2 is a joint effort between NASA, the National Oceanic and Atmospheric Administration, CNES and the European Organisation for the Exploitation of Meteorological Satellites (EUMETSAT). JPL manages the U.S. portion of both missions for NASA's Science Mission Directorate, Washington, D.C.